This holiday season, you can make hope a reality for more low-income families in the Ozarks. With your help, we can give a hand up – not a hand out – to another hardworking family in need. 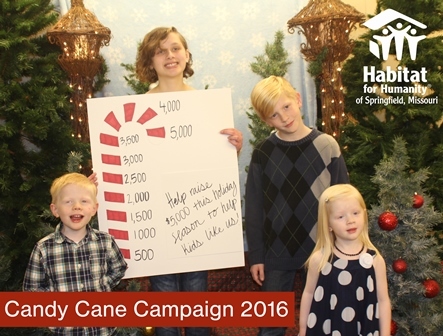 Help us reach our goal of raising $5,000 for the Candy Cane Campaign by December 31, 2016. Your gift of $25, $50, $100 or more will give a family the opportunity to build and buy their own Habitat home this holiday season! Matthew and Heidi had little hope of ever owning their own home. Although they both worked hard, they barely made enough to afford a one-bedroom apartment for their family. Fortunately, Matthew and Heidi heard about Habitat for Humanity. They applied and were accepted based on their need and willingness to partner in our program. That’s right – we offer families a hand up, not a hand out. Each family invests hundreds of hours of sweat equity to help build their home. And when construction is complete, they make affordable mortgage payments that we use to build and repair more homes for families in need! As you think about being “home for the holidays” this year, will you help ensure that more families like Matthew and Heidi’s can have a decent and affordable place to live? When you support the Candy Cane Campaign, you will give a gift they’ll never forget…a place to call home.